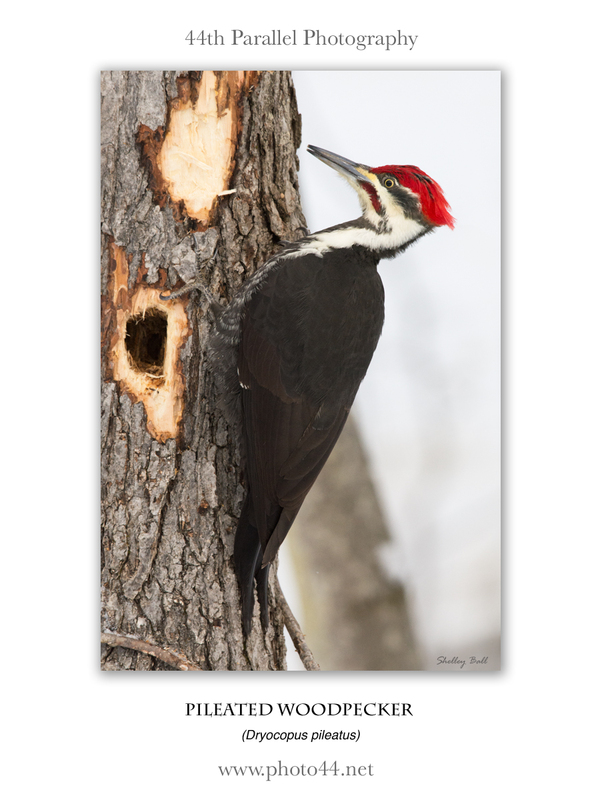 Last weekend I was coming in from filling up the bird feeders when I noticed a beautiful Pileated Woodpecker on a tree in the woods beside our house. It was madly ‘drilling’ holes in the tree, in search of juicy insects to eat. I didn’t think I’d get back into the house without disturbing him so instead I just enjoyed watching it for a few minutes and soaking up the beautiful sight. I went inside and was amazed that it was still there, busily excavating the tree trunk. So I grabbed my camera, my 600 mm lens and crept out the door. I was sure it would fly away before I could get my camera set up. Nope. So I took a few shots and then moved closer. It still seemed oblivious to me. So I took a few steps closer. Still ok. At one point the bird looked at me, but it certainly didn’t seem very concerned. It just went back to busily excavating in search of dinner. Recently, I was very kindly invited by Andre of wildphotomag to be interviewed and to submit a portfolio of images for his wonderful online nature and wildlife magazine. If you haven’t seen wildphotomag, check it out. There are fantastic articles and images in there, by a lot of talented photographers. The May issue is out and my portfolio is in there. Have a look and let me know what you think. Not only was it nice to be able to have a selection of my images in the magazine, but it was great to be able to share some of my thoughts about photography. I am truly passionate about conservation photography. I think it’s an amazing tool for creating awareness and understanding of conservation and environmental issues and hopefully, for fostering concern and caring for our planet and all of its species. Wildphotomag is loaded with great articles. Check out this month’s issue. You won’t be disappointed. Recently, Wildphoto magazine put out a call for nature and wildlife photographers around the world to submit their details for inclusion in a database of photographers around the world. All great reasons to add your name! And help support a fantastic online magazine. And if you haven’t checked out Wildphoto magazine before, I highly recommend you do. Just click on the thumbnail below to visit their site and view this months issue. Tomorrow, I’m giving a talk for our Digital Directions group of our local camera club, the Lanark County Camera Club, on the captive wildlife photography shoot I did at the Muskoka Wildlife Centre in December. You can read more about the photo-shoot by clicking HERE. To prepare for the talk, I went back to process a few more images. 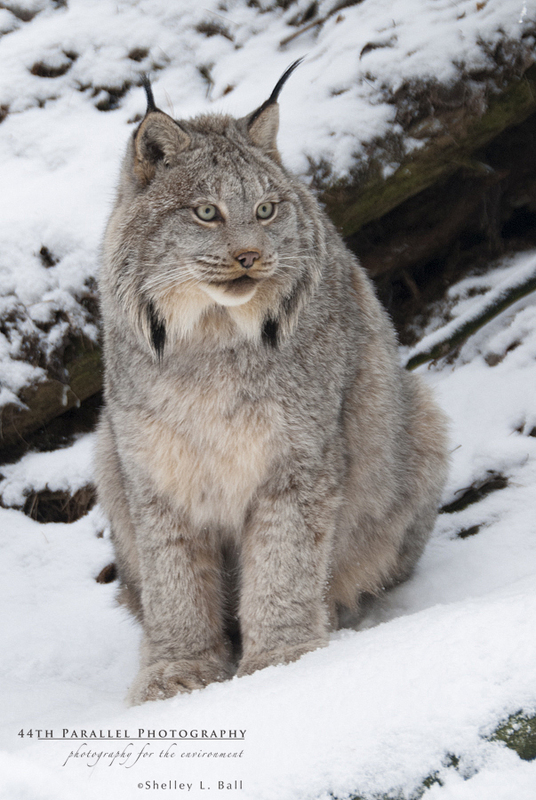 Here’s one of a Canada Lynx from that shoot. I love that iconic lynx pose, those black ear tufts, and piercing eyes. Captive lynx at the Muskoka Wildlife Centre. I received my Christmas present a bit early this year. A few days before Christmas I headed up to Muskoka Wildlife Centre near Orillia, Ontario, Canada. For me, about a four and a half hour drive away. I’d been eyeing Ontario photographer, Raymond Barlow’s captive wildlife shoot at the Muskoka Wildlife Centre for several months. And well, since my hubby was going to be in New Zealand for Christmas, I figured it was time to treat myself and to get out and do something really fun for the holidays. Oh man, I was not disappointed….. (but I’m getting ahead of myself here). Ray has an arrangement with the wildlife centre where he brings in small groups (max 6) of photographers for a special photo-shoot of some of the centre’s captive wildlife. It brings in revenue for the centre, promotes the centre, and provides (in my opinion) one of the BEST opportunities for photographing captive wildlife that we have around here. So, I signed up, but tried not to get toooo excited about it because I didn’t want to have a preconceived notion of what it would be like, only to be disappointed by the photo opportunities. For me, this was basically an experiment. An adventure. I’d never photographed captive wildlife before. Initially I had mixed feelings about it. But hey, I’m a biologist. I know that unless I quit my day job and live like Grizzly Adams in the Canadian Rockies, that my likelihood of ever seeing a cougar in the wild, let alone photographing one, is about the same as the likelihood that I’ll win $50million in LottoMax. Actually, I think the probability of me winning the $50million is higher…. So, when you know that it might take 10 consecutive lifetimes to ever see an animal like that in the wild let alone capture it in pixels, you concede that photographing captive wildlife isn’t such a bad idea. And so, I signed up for Ray’s workshop. We met at the wildlife centre at 9 am and Ray prepped us for the shoot by describing what the setting was like and what the best strategy was for getting good images. In retrospect, all excellent advice. We were then introduced to Dale Gienow, a co-founder of the wildlife centre, expert animal handler and just one heck of a nice guy (and also has the distinction of being the top jouster in Canada – go figure…). Dale gave us an introduction to the wildlife centre, why it exists and how it exists. I was surprised to learn that many of its resident animals are super-stars and that they should be signing autographed photos…. Dale routinely works as Scientific Advisor for wildlife documentary films produced by BBC, National Geographic and aired on the Discovery Channel and Animal Planet. I was surprised to hear of their international reputation, but once we were in the enclosures and working with the animals, it was abundantly clear that this was a top-notch facility, where the animals are treated like royalty and their health, happiness and safety is an absolute first priority. All I can say is…. IMPRESSIVE! 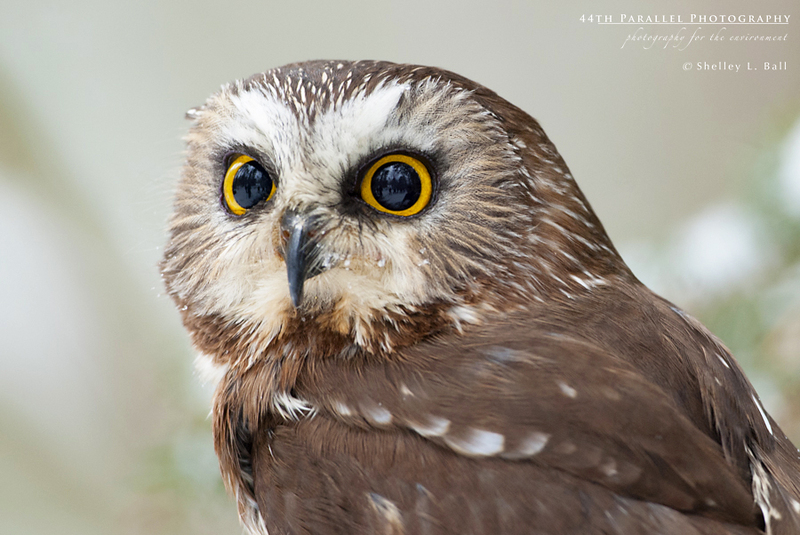 Dale described how we would be photographing each of the animals for that days photo-shoot: Timber Wolves, Cougar, Silver Fox, Canada Lynx and a Saw whet Owl. All of the larger mammals live in huge, outdoor fence enclosures that contain native vegetation. For all but the cougar, we were in the enclosures with the animals. At no point was I ever concerned about my safety. It was abundantly clear that Dale and his assistant were expert animal handlers and also knew each of these animals personalities like the back of their hands. This meant that we could relax, enjoy the experience, and make the most of our photographic opportunities. Just as we set out, it started to snow. And snow. And snow. I mean, holy cow, it snowed! Heavy, wet snow. And lighting conditions were challenging – very dark. But hey, you make the most of your situation, whatever it is. I ended up shooting primarily with my Nikon 18-200 mm lens because we were so close to most of the animals. 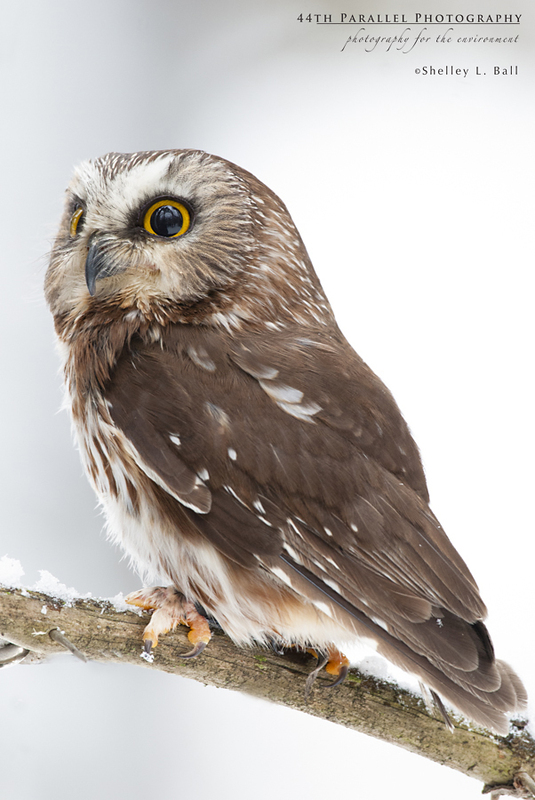 I lugged my Nikon 600 mm bazooka with me, but only used it for photographing Lulu, the super-star Saw whet Owl. 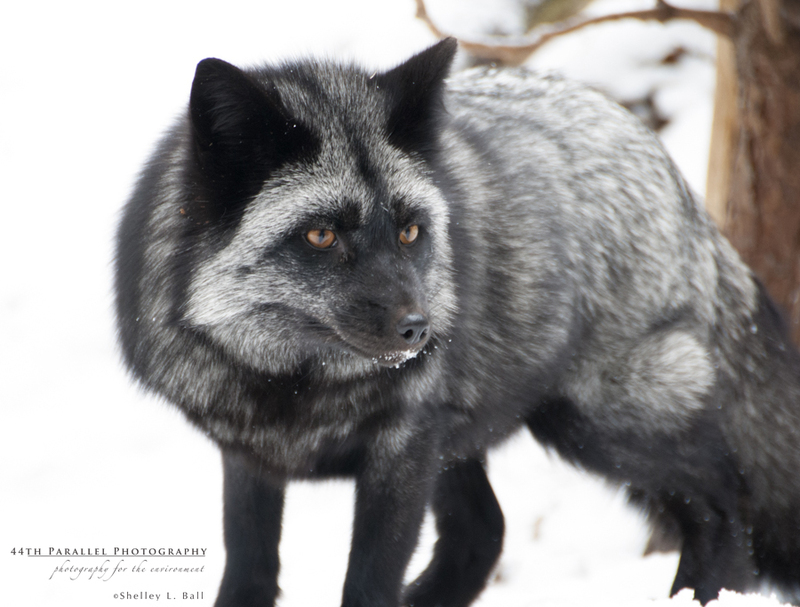 We entered the huge, fenced enclosure and when ready, Dale let out two gorgeous Timber Wolves. A male and female pair. Stunningly beautiful animals! At first I cursed the heavy snow and low light conditions. I’d forgotten my lens hood and so snowflakes kept glomming to my lens. I’d quickly try to wipe them off, but instead, smeared water all over my lens. Arrggghhh! But I quickly adapted, got into a rhythm of shooting and made the most of it. But, you make the most of your situation and I did. When the wolves paused, I made the most of those opportunities and rattled off a lot of frames, careful to compose as best I could and ensure that the fencing was not visible in the background. Dale and his assistant were great at getting the wolves to move around so that there was lots of opportunity to photograph them with only a forest environment visible and no fence in the background. These guys were good, I mean, really good. They worked hard to help us get the good shots, but what I loved was that the animal’s welfare was always their top priority. Just the way it should be…. It wasn’t till I got home and looked at my images that I saw how the slow shutter speed along with the heavy snowfall and dull light conditions made for magical shooting conditions. 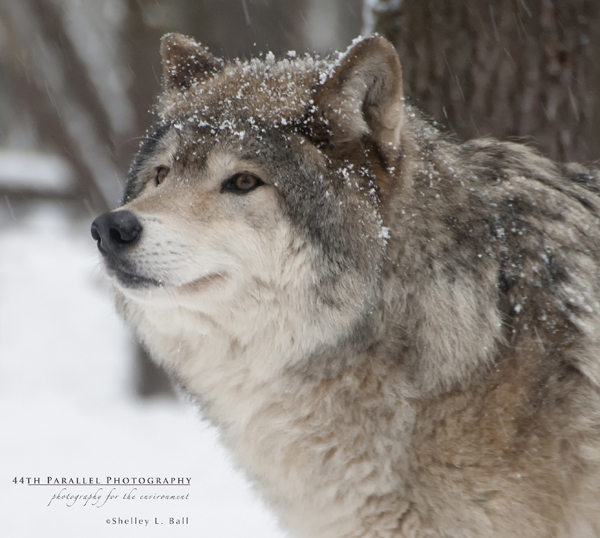 Have a look at my image of the female Timber Wolf, above. See how the falling snow and slow shutter speed create soft, white, vertical lines? And the dull light conditions actually created a soft feel to the images. Had I had a better camera for the shoot, I would have had a ton more images that were keepers. But I’m still happy with what I did get. And most of all, it was the experience of being in the pen with those wolves that was the real high. 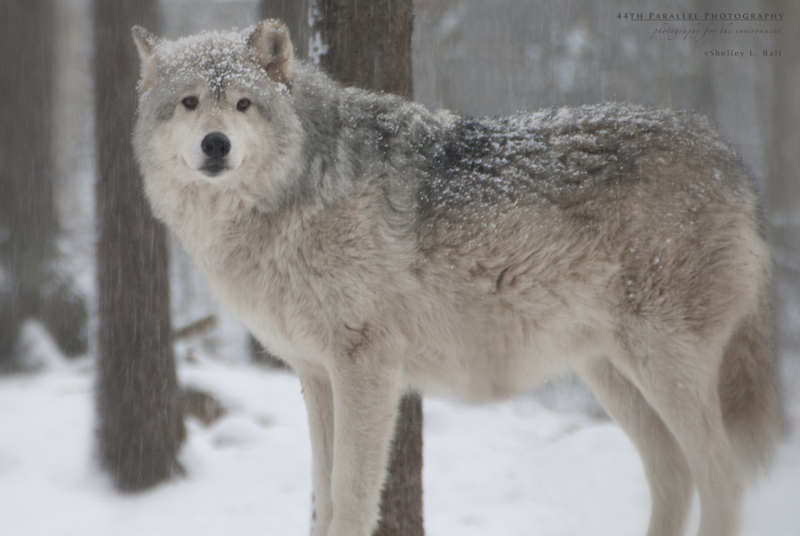 Male Timber Wolf at the Muskoka Wildlife Centre. Next on the photo-menu was the cougar. It’s a no-brainer to understand why we were not allowed inside the enclosure with it. Most of these animals have been hand-raised from a young age and so they are used to people. But still. This is a 150 lb cat with millions of years of evolution that have shaped its behaviour and instincts. So we went inside the outer fenced enclosure, but stayed outside the inner enclosure. This meant shooting through the chain-link fence. Another challenge. But to be honest, not that big of a problem. 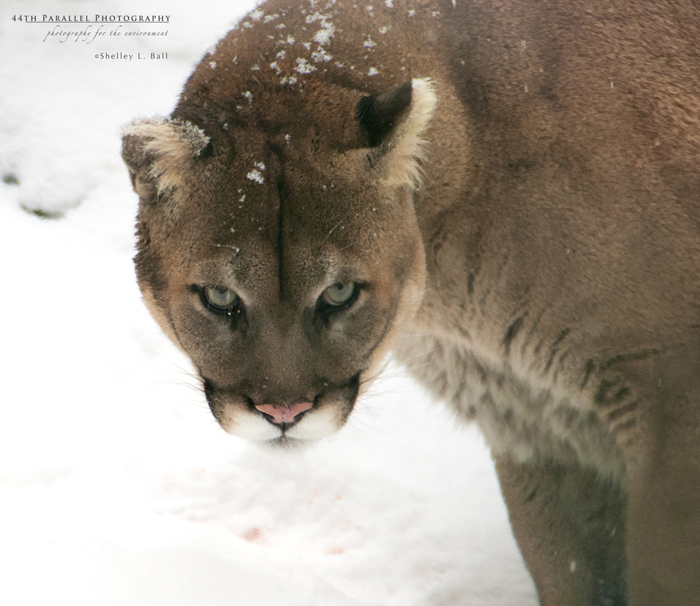 The cougar came so close to us that my 18-200 mm zoom was all that was necessary to capture some beautiful face shots. Dale and his assistant were there to keep things safe. When the cougar walked by us on the other side of the fence, we quietly took a step back just in case. 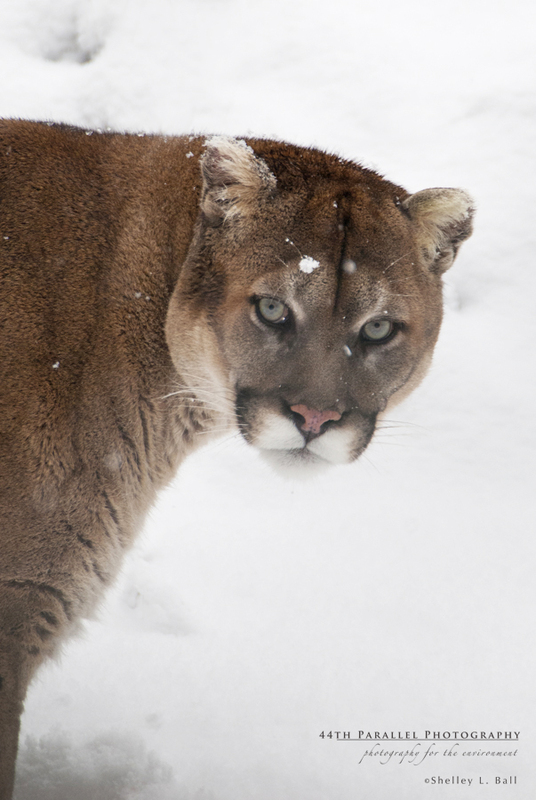 But let me tell you, to be a foot away from a cougar and to have your eyes meet his…. it’s an experience that stirs your soul. I once had a mind-meld with a wild Beluga Whale in Churchill, Manitoba. Looking into the eyes of this cougar was on the same order as that. Indescribable…. Next on our photo safari was a Canada Lynx. For this one, we were in the enclosure with the cat. And what a cat it was. Wow…. Such a beautiful animal. Dale and his assistant kept the cat at a reasonable distance from us, maybe 6 feet away. It was perfect for making some amazing images. At one point I stopped shooting just so I could admire this beautiful cat – it’s huge, snowshoe paws, those dapper, black ear tufts, and the luxurious fur. Ya, I’m a biologist and so for me, it wasn’t entirely about the photography. It was about seeing these animals up close. Animals that even the most active outdoors person is so unlikely to ever encounter. 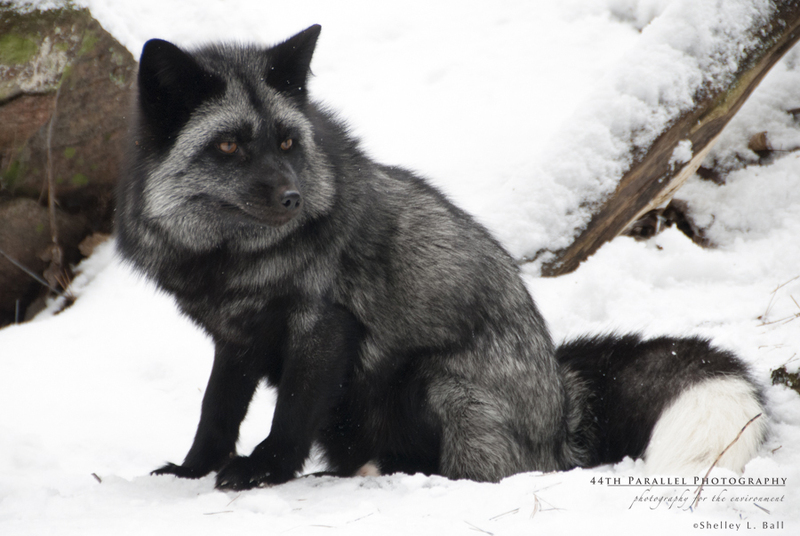 Next on our safari was a Silver Fox. 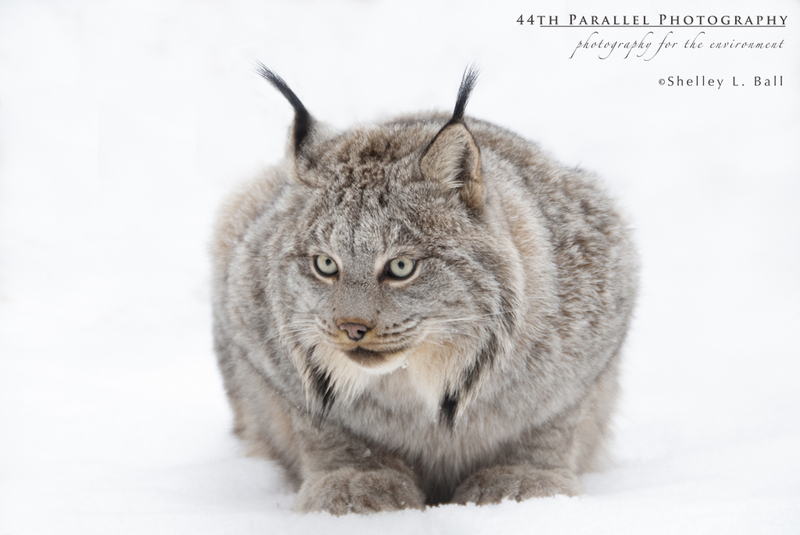 We photographed him in the same enclosure as the Lynx (after the Lynx had been moved to another pen) and so were able to make images of it from 6 feet away. What a gorgeous animal. 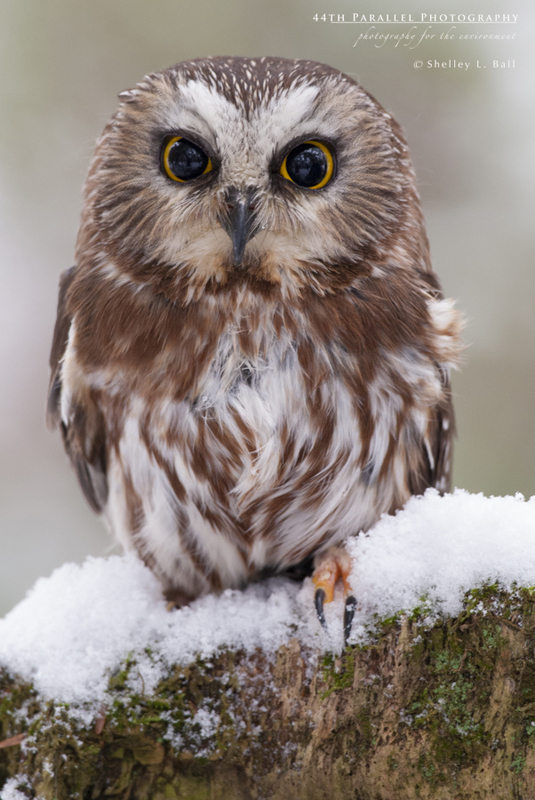 And those penetrating copper eyes against the black and smokey grey of its fur…. 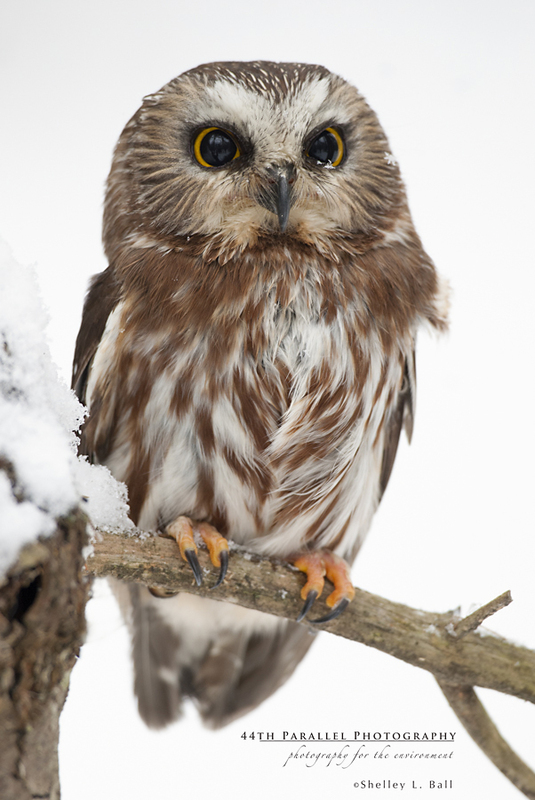 Our final photographic subject was a beautiful little Saw whet Owl, named Lulu. Lulu is a super-star! She’s the same individual animal that was used to make the Telus Mobility TV ads. So she’s a TV star. I know I should have asked for her autograph…. 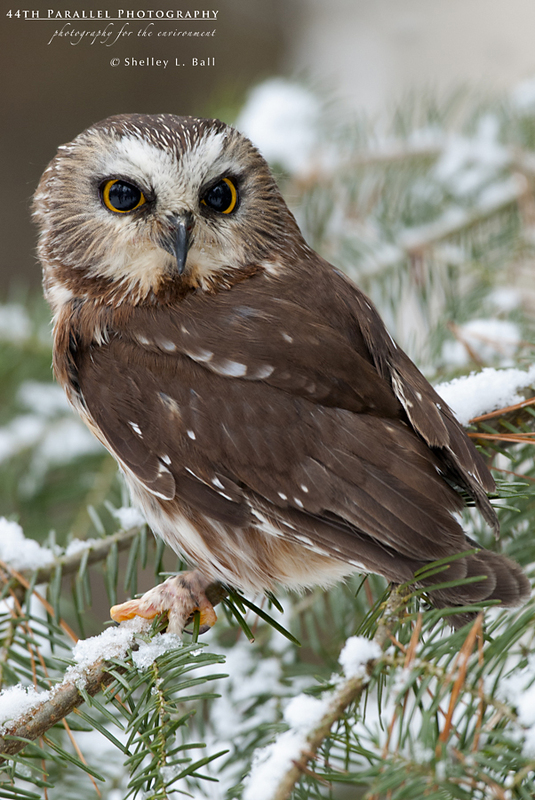 Dale placed her on several different branches to provide a variety of backgrounds and perches. This is where I hauled out my 600 mm bazooka, took several steps back and began shooting. Wow! The outstanding glass on that lens sure captures the fine details of feathers. After we’d finished our official photo-shoot, Dale invited us to wander around the centre on our own, to photograph other animals in the outdoor pens or to come back inside to meet the skunks, opossum, Northern Bobwhite, Blanding’s Turtle, and the variety of other interesting critters housed inside. All I can say is that photo-shoot was one of the BEST experiences I’d ever had. It was some of the most challenging shooting I’d ever done. But also the most satisfying. And to be honest, if I’d come away without any nice images, the entire experience still would have been worth every penny. Would I go back and do it again? You bet! In a heartbeat. A footnote: I was trolling through the Fine Art America website since I’m working on uploading some images to it for selling. Out of curiosity, I searched for images of wolves, cougars, foxes and the like. I have to say that I was appalled to see that only a few photographers actually listed their images as being those of CAPTIVE wildlife. In fact, the only ones who specified that theirs were images of captive wildlife were the professionals – people who are internationally renowned. The rest didn’t give it a mention. And I swear that one person had images that were also made at the Muskoka Wildlife Centre. Maybe I’m wrong, but the backgrounds looked awfully familiar….. My point here is that as photographers, I think we MUST be honest. I’m a biologist and so I know that most images of wolves, cougars and similar wildlife are of captive animals. Frankly, you can pretty much tell by the kind of image. Anything close up is captive. There were images by Paul Nicklen – images of Lynx and other wildlife that you know are authentic, that you know are of wild animals. But the rest….. come on guys… come clean. There’s an ethical issue here. If it’s an image of a captive animal, say so. Don’t try to pull the wool over the eyes of someone who doesn’t have the knowledge to know that the chances of photographing a cougar, close-up, in the wild are next to nil. And I don’t buy the excuse that they didn’t say they were wild. The omission of the word captive still makes you guilty in my mind. Let’s call a spade a spade…. Bottom line – this was an absolutely fantastic photographic experience on all fronts and I wouldn’t hesitant a second to recommend it. In fact, I hope I’m going back. Maybe in the fall, at the height of the fall colours and hopefully by then, with a better camera for the job…. Bear 71 – a must see…. Today I was reading my digital subscription to Canadian Wildlife Federation’s magazine Canadian Wildlife. In it is an article on Bear 71. Or more specifically, an article about the web-based documentary, called Bear 71. Yes, a web-based documentary. To be exact, it’s an interactive web-doco that blends video, photography, mapping, data, neat computer animation and music. It’s a really unique format. Created by Gemini Award-winning, Leanne Allison, Jeremy Mendes, and co-presented and produced by the National Film Board, it’s like nothing I’ve seen before. The story is about Bear 71, her life in and around Banff National Park and that of her three cubs. What’s particularly appealing about this doco is that it’s told from Bear 71’s perspective. Now before you go and criticize it for being overly anthropomorphic, just watch the documentary. I don’t think you can help but be moved by it. Actress Mia Kirshner is the voice of Bear 71. Her narrative is poignant, as Bear 71 tells her story about living in an environment that is increasingly touched by humans. She tells of her life with her three cubs and in the end, of her own demise when she is killed by a train while walking on the tracks. The web link opens with a page that lets you choose to be a character (e.g. Bear 71 or some other character like a mountain lion or big horn sheep). Once you’ve chosen your character, the page shows a trail camera photo of the animal and provides a description of the individual and it’s life. It also presents statistics on the conservation status of that species. If you click on “Check out the website” at the bottom of the page, this takes you to the web documentary, which opens with some footage showing Bear 71 caught in a leg noose and being tranquilized by conservation officers, then fitted with a radio collar. Next, the video transitions into a funky virtual landscape – a digital representation of the topography in and around Banff National Park. It shows the location and movement of Bear 71 through the virtual landscape, as well as the movement of several other critters. You can move your cursor around to move through the landscape, passing towns, rail tracks, wildlife trails and natural features such as lakes. While roaming the virtual landscape, Bear 71’s narrative plays and your roaming is interspersed with video clips of Bear 71 and music. It makes for a very moving bit of storytelling. Kudos to Allison, Mendes, and the NFB for their creative and innovative storytelling. I think one of the most effective aspects of the documentary is that the story is told from Bear 71’s perspective. For me, that’s the key to the impact of this doco. It’s not just a documentary about a bear; it’s about Bear 71, by Bear 71 and it is therein, that the story really tugs on your heartstrings. I encourage you to check it out. I’m a huge fan of using digital media to promote conservation. The key to effectively delivering a conservation message lies in creating a message with impact. This documentary definitely has impact. Have a look and let me know what you think of it. Last week I went up to Whitehorse, in Canada’s Yukon territory, for work. My first time north of the 60th parallel. Woohoooo! Since I was making the long journey from Ottawa to Whitehorse for a 2 day meeting, I just couldn’t pass up the opportunity to tack on a few days of personal leave to look around. And even better, a very good friend of mine (also a rabid photographer, check out www.tradewindsphoto.ca) lives 3 hours north of Whitehorse. And so we schemed to get together with our cameras and big lenses and ‘pull a Thelma and Louise’, which means road tripping (with a much better ending) with our cameras. We spent 2 days driving around the area south and southwest of Whitehorse, photographing the Trumpeter and Tundra Swans on their migration back north to breeding grounds. We also photographed an uncommon black colour morph of the Arctic Ground Squirrel. Of course, there was the stunning scenery….. In two days I shot just over 1300 images. Not really a lot in my mind, but some people think that’s a lot. I just wish I had more than 2 days to toot around the Yukon with my friend. But those two days is all it took for me to fall in love with the Yukon. What a place…. It’s rugged, wild, wide open. People are friendly. Whitehorse must have more excellent restaurants and cafes per capita than any other place I’ve been! Although my trip was short, I was not disappointed by the wildlife we did see on those two, brief, chilly and mostly grey days. It was enough to whet my appetite and for me to promise myself that I’ll be back…. 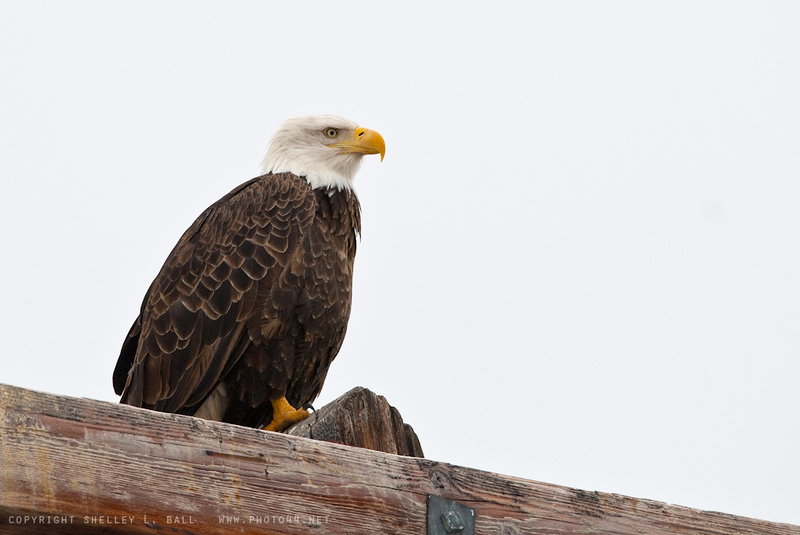 Here is a photo of a Bald Eagle taken at the Tagish River. More Yukon images to come so keep tuning in to see what’s next!